Researchers have raised the prospect of scientifically monitoring the emotional interaction between people and horses, after evaluating a wearable system to monitor human-horse activity. 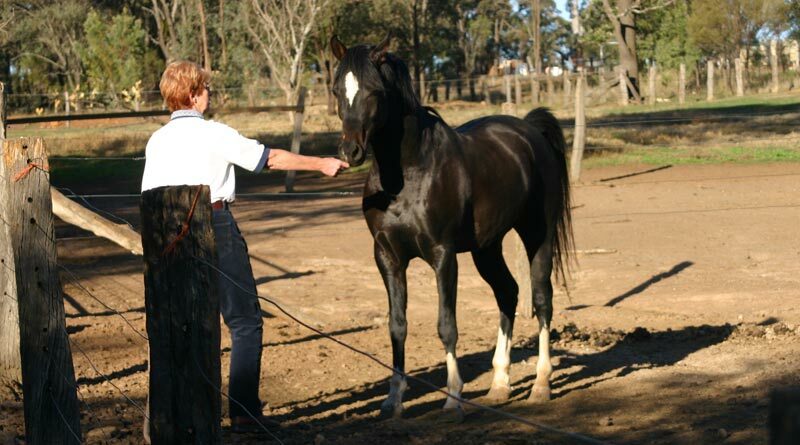 The Italian study team reported on their monitoring of human-horse interaction by way of heart-rate variability. They did so by using the dynamic time warping algorithm. While it sounds like something out of science fiction, dynamic time warping is the name given to an algorithm for measuring the similarity between two time-related sequences which may vary in speed. The University of Pisa researchers, Andrea Guidi, Antonio Lanata, Paolo Baragli, Gaetano Valenza and Enzo Pasquale Scilingo, described a wearable system for monitoring heart-rate variability in their study published in the journal Electronics. The system comprised of what they described as a sensorized T-shirt for the human and an elastic smart belt for the horses, developed by Smartex in Pisa, Italy. In both systems, two textile electrodes and a strain gauge sensor were knitted and integrated into the designs. Firstly, they assessed the horse belt in terms of its comfort and robustness in seven horses, then introduced a preliminary objective estimation of the human-horse interaction under their specific experimental protocol, using the dynamic time warping algorithm. The performance of the wearable system for horses was compared with a standard system in terms of the percentage of movement artifacts. This is the amount of baseline “noise” contamination normally originating at the skin-electrode interface, in this case due to the motion of the horse. Seven hours of ECG recording was analysed. The e-textile-based system outperformed the standard monitoring one, they reported, in terms of comfort and reduction of the amount of movement artifacts. “It is worthwhile to note that textile-based wearable monitoring systems offer interesting advantages in horse applications,” they wrote. “In fact, it resulted in being very easy to use and very comfortable, and it could be automatically placed without any adhesive, glue and adhesive bandages. It was, they said, possible to record an artifact-free ECG. They then turned to human-horse interactions, where the challenge is to align the two sets of data. This is where the dynamic time warping came into its own. It was applied to estimate what the researchers described as the dynamic coupling between human and horse in a group of 14 human subjects and one horse. The wearable monitoring system for humans. The e-textile electrodes for ECG (electrocardiographic) acquisition are knitted and completely integrated into the garment. The work was successful. Using data analysis, they were able to recognize the three phases of interaction used in the study with an accuracy greater than 78%. The first phase had the human sitting on a chair in a stall, while the horse was free to move about in the adjoining stall. In the second phase, the horse was moved into the human’s stall, where the person remained seated on the chair. In the third phase, the participants were asked to stand up and groom the horse. “Preliminary significant results showed the discrimination of three distinct real human-animal interaction levels,” they reported. “The achieved results lead us to conclude that a quantitative measure of the human-horse interaction is viable, and it could be very effective in many fields of application, for example in therapy assisted by equine or for controlling the effect of therapeutic horseback riding. “In this field, our paradigm could permit analyzing the emotional interaction of a human patient with a ‘standardized horse’ (a horse specifically trained and managed to create a controlled positive emotional background with a human). Andrea Guidi Antonio Lanata, Paolo Baragli, Gaetano Valenza and Enzo Pasquale Scilingo.